The second installment in my Heidelberg series. To read the first installment, please click here. Once you have taken in the magnificent Old Town of Heidelberg, it’s time to see Heidelberg Schloss! There are several ways to get up to the castle from the Altstadt, including taking a funicular. But, if you’re feeling a bit adventurous then hiking up the hill from the town is also an option. There are beautiful huge old German houses and manors that line the hillside up towards the castle. My Dad still talks about how he would play at Heidelberg Castle in the 1950s and 60s as if it was his own personal playground. Unfortunately, these days if you want to frolic around the castle grounds — you have to pay for the privilege. They charge for entry. The main courtyard of Heidelberg Castle is an impressive sight. Faded orange and pink stone buildings of various size and structure surround the center threshold. The main hall is large and looming with life size statues lining the outside of every floor. Elisabeth Gate stands nearby with it’s beautiful carvings and small cherubs that adorn the top of it. As charming as the castle is, the view below is still the most spectacular sight. The Neckar River, the green valley and of course the Old Town below create an incredible view. The castle’s earliest structure was built some time in the early 1200s and was expanded and rebuilt several times over in the following centuries. Victor Hugo once remarked in a letter, “Five hundred years long it [Heidelberg Castle[ has been victim to everything that has shaken Europe, and now it has collapsed under its weight.” It’s true, Heidelberg Schloss was in the thick of several wars, damaged by fire and even struck by a bolt of lightning! The only reprise it seems to have received is it escaped damage from both world wars. 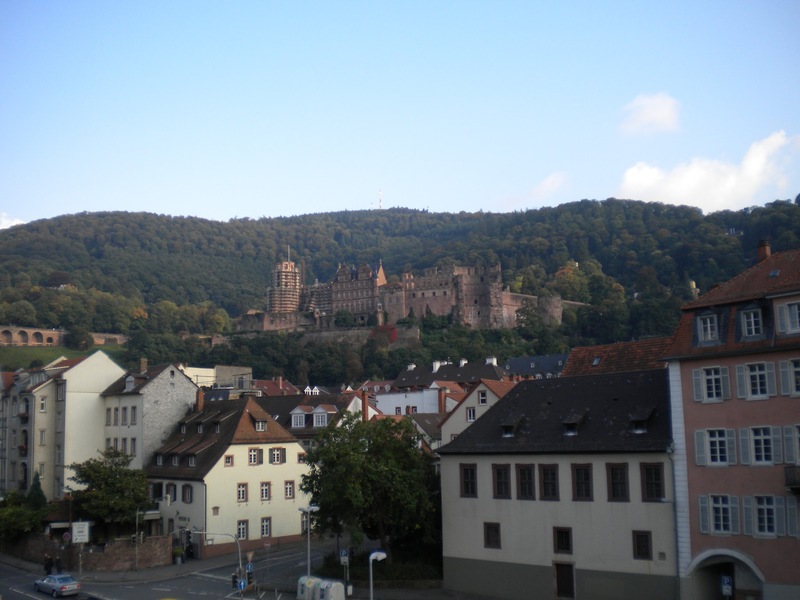 Upon touring Heidelberg Castle you will see two artifacts that represent the regions most famous legend. The first is the Heidelberg Tun or the “World’s Largest Wine Barrel.” This barrel can store 58, 124 gallons (220,000 litres) of wine! It was used to provide wine year round to the inhabitants of the castle. Not far from the tun is a life size statue of a man afflicted with dwarfism. This is Perkeo, the famous court jester at Heidelberg Schloss during the 18th century. Legend goes that Perkeo was a lover of wine and could drink anyone under the table. Due to his slight size this both amazed and amused the court. Supposedly Perkeo consumed between 5-8 gallons of wine a day! This led to Prince-Elector Charles III Philip to putting Perkeo in charge of the Heidelberg Tun. Legend has it that Perkeo lived into his eighties but one day fell ill. The doctor prescribed he drink water (after years and years of drinking only wine). After consuming a cup of water, Perkeo died the next day. After finishing a tour of Heidelberg Castle, make your way back down toward the Altstadt to the grand Old Bridge that crosses the Neckar River. The Old Bridge or Alte Brücke was built in the 1700s and was the first stone bridge built over the Neckar. This was intentional as all of the previous bridges had been made of wood and easily destroyed by wars and floods. The bridge links to the gate of Heidelberg which stands grandly as two white towers and a grand entryway. This gate stands on the Old Town side and serves as an entry into the Altstadt. As mentioned in my previous post, the Old Bridge was one of the few parts of Heidelberg to suffer damage during WWII. As the Nazi’s were fleeing the city from the approaching Allied forces they destroyed all of the bridges on the Neckar River (including the Old Bridge). Three of the Old Bridge’s nine arches were destroyed. Donations were quickly raised among the townspeople after the damage occurred and by 1946 construction to rebuild the bridges had commenced. Heidelberg is a unique city for me because it holds a lot of memories for me and my family. It is a city that I know I will continue to return to. My sentimentality aside, Heidelberg is a city I would recommend to any visitor looking to stop in Germany. At the very least, it’s well worth a day trip. In many ways, Heidelberg delivers what Germany is known for — beer, castles and a fairy tale landscape. It looks a lovely city, will have to put on my list of cities to visit.